Kryptonian Warrior: Fantastic Four Movie Reboot Cast Confirmed? News hit the web on Thursday just gone regarding the proposed (although I don't think officially confirmed by Fox) cast for the upcoming Fantastic Four movie reboot. The internet has literally imploded with discussions and arguments for and against things like age (cast is too young? ), race (Michael B. Jordan being a black actor portraying a white character), size (Jamie Bell being a tiny English actor portraying the always huge Ben Grimm/Thing), and Fox studios not knowing what the hell they're doing with their Marvel movie rights compared to Marvel/Disney. From left to right - Miles Teller as Mr. 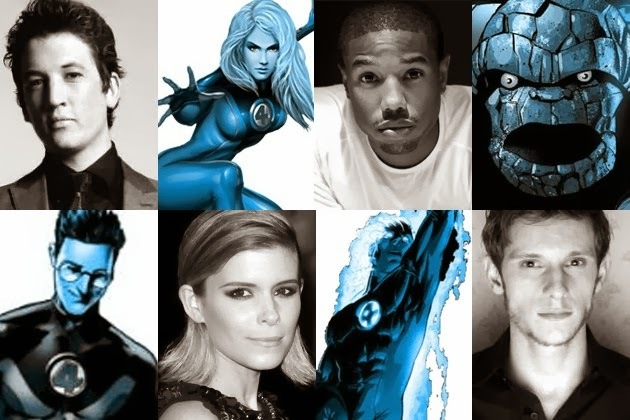 Fantastic, Kate Mara as The Invisible Woman, Michael B. Jordan as The Human Torch, and Jamie Bell as The Thing. I know nothing about Miles Teller. He could be good, he could be bad. We'll have to wait and see. Johnny Storm/The Human Torch is a white character and without wanting to get into the whole racism argument why the hell would Fox make him black? Do they remember that he's Sue Storm's biological brother for a start? I gather there will be some sort of explanation given (one of the same parents, but not both) to tell us why this was done. Not going down well with fans at the mo but those who argue for Michael may say he's a good actor and that the only important attribute that is necessary on screen for Johnny is to have flame/flying powers, but I think messing with Marvel's first family is just plain wrong. People will still watch the movie for sure but would fans accept Will Smith as Captain America or Leonardo DiCaprio as Black Panther? Hmmmm. Jamie Bell as Aunt Petunia's ever-loving blue eyed Thing? Are you kidding me? Brooklyn born and raised Ben Grimm, the hulk of a man that transforms into one of Marvel's biggest heavy hitters played by the skinny guy who once played Billy Elliot? Don't understand this casting choice at all. Kate Mara. Hmmmm. Now this choice I don't have much to say about. I love Kate Mara and her work and I can see her as the young Sue Storm/Invisible Woman, in fact if you've ever seen the 2006 kids superhero movie "Zoom" then you may already have an idea of what a Kate Mara/Sue Storm may be like on screen (albeit much younger). To be honest it's the only bit of near-positive casting so far.